The Dubai Ice Rink is an Olympic-sized ice skating rink at the Dubai Mall in Downtown Dubai. It is the largest and best-equipped rink in the city. It’s situated on the ground floor of the mall but extends up to the second floor. Public skating sessions run every day in 1¾ hour slots from 10 am until late in the evening. Disco sessions are held in the evenings. Reduced priced sessions for mothers and young children are held during the first skating slot of the day. A skating coach is available to provide assistance and advice. Penguin Pal skating aids can also be hired to help youngsters maintain their balance and develop the correct stance. Lessons are also available but must be booked in advance. Group and individual tuition is available. 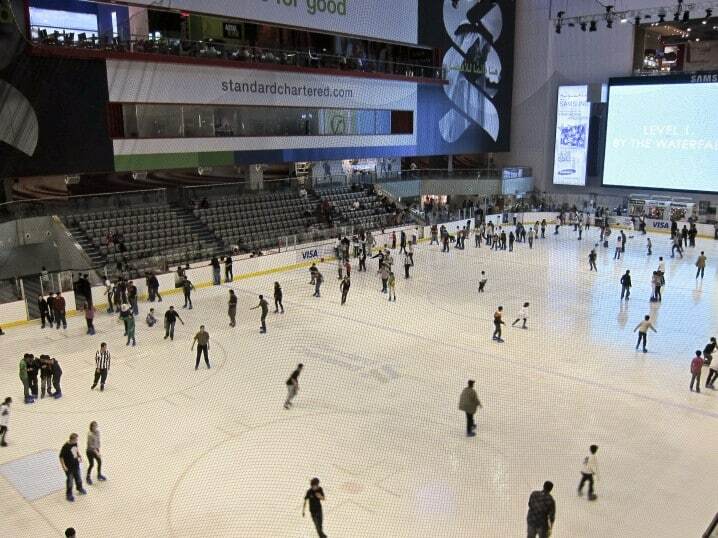 The Dubai Ice Rink also hosts Emirates Hockey League games. Free seating is available. Matches can also be watched from the shopping mall balconies overlooking the rink. Facilities at the rink include lockers, a snack bar, spectator seating, and a skate shop selling a range of skating merchandise such as figure and hockey skates, t-shirts, ice hockey sticks, pucks, and more. The standard price for a 1¾ hour session is 55 AED (25 AED for children under 100 cm). For complete details of prices, timings, lessons, and group discounts visit the official Dubai Ice Rink website. The Dubai Ice Rink is situated on the ground floor of the Dubai Mall. Opening hours are Sunday to Wednesday 10 am to 10 pm, and Thursday to Saturday 11.15 am to midnight. Visitors are advised to check on the official website to ensure the rink is not booked for a special event before setting off. KidZania (0.1 miles) - Edutainment centre at the Dubai Mall. 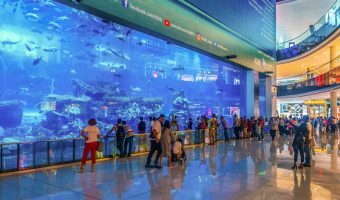 The Dubai Aquarium & Underwater Zoo (0.1 miles) - Aquarium at the Dubai Mall. Reel Cinemas Dubai Mall (0.0 miles) - 26-screen cinema at the Dubai Mall. Reel Cinemas Rove Downtown (0.4 miles) - Boutique cinema at the Rove Downtown Dubai. Thiptara (0.4 miles) - Thai restaurant at the Palace Downtown. Indoor and outdoor dining areas. Terrace overlooks the Burj Lake and offers good views of the Dubai Fountain and Burj Khalifa. Ewaan (0.4 miles) - Arabic restaurant on the ground floor of the Palace Downtown. Live cooking stations. Friday brunch. Indoor and outdoor seating. View of the Burj Khalifa. Mint Leaf of London (0.8 miles) - Contemporary Indian restaurant on the 15th floor of the South Tower of Emirates Financial Towers, DIFC. Floor-to-ceiling windows offer great views of the Burj Khalifa. Al Grissino (0.9 miles) - Italian restaurant on the 16th floor of the South Tower of Emirates Financial Towers, DIFC. Unique bar offers spectacular views of the Dubai skyline. Bombay Brasserie (0.9 miles) - High-end Indian restaurant at the Taj Dubai in Business Bay. Features an open kitchen and luxurious interior. Offers good views of Burj Khalifa. Map showing location of Dubai Ice Rink. The disco sessions are the best. I have seen more people at the Ice Rink during evening disco dessions. Dubai Ice Rink has great special events. It is amazing to think that you can go ice skating in the middle of a shopping mall in the desert, but this is Dubai. My son had a great time and penguin was an excellent idea for a novice skater. The kids enjoyed it here. Prices were pretty good, especially for the kids (only the equivalent of about £5). They even got these penguin things to help them keep their balance.